Bark Busters Home Dog Training is a unique, dog-friendly methodology bases on a holistic approach. Founded in Australia nearly 30 years ago, Des Moines is lucky to have access to this natural way of training! To say that dogs are my passion is an understatement!! I believe that every dog is trainable and my mission to give even the most fearful and aggressive dogs a better life. I simply love what I do!! I grew up in Ankeny and attended Drake University. After graduating with a Bachelor’s degree in Journalism, I worked in that capacity for a year before returning to school. I then graduated from Northern Illinois University with a Master of Arts degree in Journalism with an Advertising emphasis. For the next 25 years, I had a successful career in advertising sales that had me traveling many weeks of the year. With early retirement within sight, I finally could have a dog of my own and Lucy came into my life. She has been a GREAT dog but early on, I could not control her barking and despite spending hundreds of dollars on training and trainers, she STILL barked and pulled on leash (while barking). I was EMBARRASSED! It was Bark Busters holistic method that finally helped me to relate to her in a way she understood. I am so happy that she now looks to me as the decision maker and that I know how to give her the calm she deserves! I teach dog parents just like you how to communicate clearly with their fur baby in a way he/she understands and how to cultivate an environment to foster a calm, happy canine. I do this in the comfort of your home and in the environment where the problem behavior happens. One-on-one, we can customize a program that fits you and your dog without the distractions of a classroom with 10 other dogs competing for attention. You will be amazed by how simple this approach is and astounded by how fast your dog responds! This is done without bribing with food, using dominance, or intermediary devices such as shock collars, prong collars or any other pain/fear approaches. Because Bark Busters training results in the dog making decisions, the change is not superficial. The dog’s way of seeing his world improves and because you are so instrumental in creating this change, your relationship with your dog will deepen through trust, love and respect. The first 2 to 3-hour lesson is quite in depth and you will learn how to relate to your dog, how to read his body language, how to make him happy and calm in his world and in turn – be his hero in a very special way. 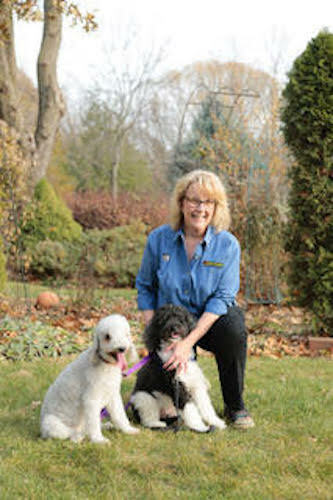 Beyond attaining advanced and master training through Bark Busters, I have furthered my learning by becoming independently certified by the Certification Council of Professional Dog Trainers and carry the CPDT-KA designation. This is independent of any school of instruction and requires a grueling 4-hour exam and continuing education. Knowledge of everything canine is of utmost importance to me. Lifetime support assures you that the issues you’re facing now will be resolved AND any future issues for the life of your dog will be handled at no additional charge. Whether 3 months after the first lesson or 3 years, I am as close as your phone should you have questions! The one-on-one approach in the comfort of your home (where the issues arise) and at a time convenient for you, saves you both time AND money. I hope to hear from you and to find out more about your dog. Shoot me an email with questions or call me!